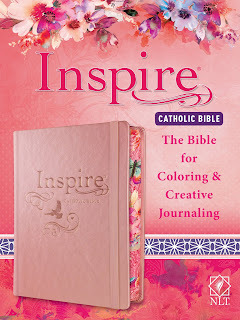 Introducing Tyndale’s newest addition to the bestselling Inspire line, and the first―and only―Catholic coloring Bible. 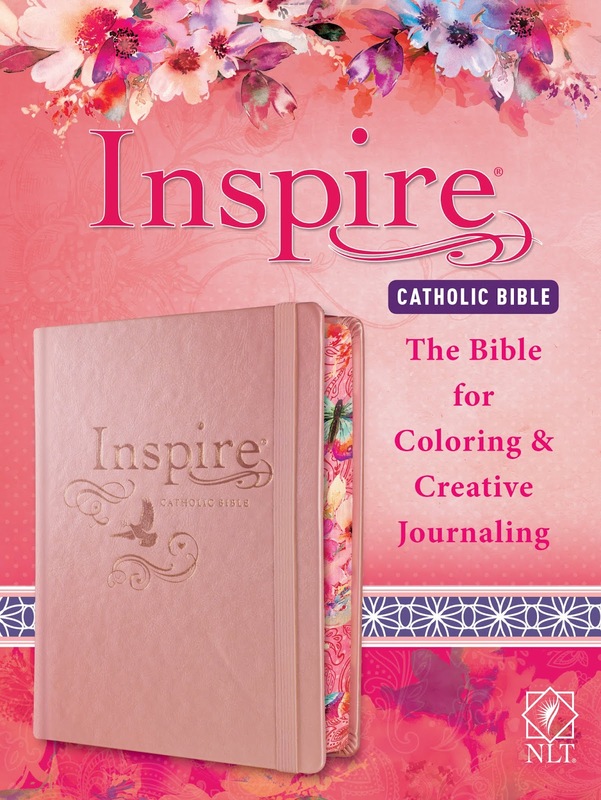 The Inspire Catholic Bible features over 450 beautiful Scripture line-art illustrations to color plus two-inch-wide lightly ruled margins with extra space to write notes and reflections or to draw and create original art. Inspire’s generous 8.65-point font is larger and more readable than most other journaling Bible fonts, and the high-quality white Bible paper is great for colorers and creative Bible journalers of all skill levels. 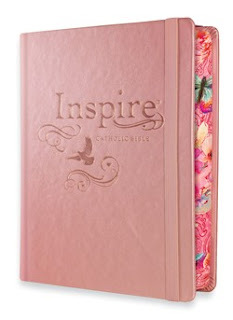 Inspire Catholic Bible’s New Living Translation text has been approved by the Catholic Church for personal reading and features the official Imprimatur. The Holy Bible, New Living Translation, communicates God’s Word powerfully to all who read it, and Inspire is a wonderful legacy Bible for readers to record their faith journey. This is a beautiful Bible with lots of extras you expect from the Tyndale family of Bibles. It's really beautiful on the outside with a rose gold cover and an elastic band for keeping it closed. It also has beautiful decorations on the sides of the pages that include flowers and butterflies. For those of you who don't know what a Catholic Bible is, it includes the additional books of the Tobit, Judith, Wisdom of Solomon, Ecclesiasticus (Sirach), Baruch (includes the Letters of Jeremiah), I and II Maccabees, and additions to Daniel and Esther. These books were eliminated from the Protestant Bible long ago, however, as a Lutheran, we also had these books in our Bible in a separate section, so I am acquainted with them. Inside you'll find gorgeous artwork that you can color and enhance with your own style. Some are full page artwork as well as artwork in the margins. Plus, there is amazing artwork on the inside covers of this Bible. The margins are extra wide, too, which I love for making notes. There are plenty of these lined margins throughout for making your own notes about what you've read or special prayers. This version is the NLT, which has become my favorite version. It's easy to read and accurate to the original Greek and Hebrew. It's a great Bible for the beginner Christian as well as the long time Christian. This Bible would make an excellent gift for Christmas, birthday's or anytime. It would also be great to buy for yourself! I love this Bible and think you'll love it, too. *This Bible was provided to me by Tyndale. I received a copy of this Bible to review but I was not financially compensated in any way. The opinions expressed are my own and are based on my observations while reading this Bible.